Marilyn's highlights of the walk on 18th March 2004, originally intended to be brief, have grown but there are still a host of things not mentioned. Wish you were there! 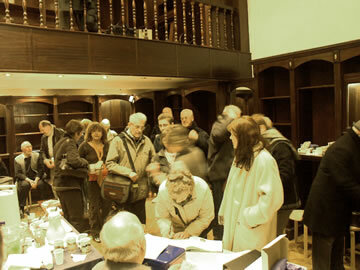 Collectors meet at this spacious empty shop in Princes Arcade for coffee and pastries. Rita Weller is signing Hazle's Visitor Book and Marilyn waits beside her. Proprieter Brian Pannaman sits in the foreground with the hot water urn to his left already surrounded by dirty cups. Hazle stood on the staircase behind Brian and briefly addressed the group. We were given access to the traders' loos conveniently opposite this shop - an important detail! 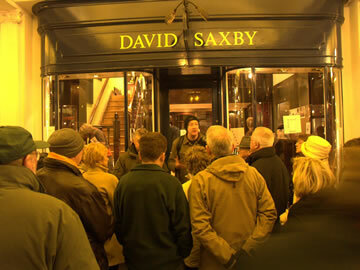 At 12 noon those willing to brave the cold gathered outside the shop, a former tailor. Our London Walks man Peter, an actor, stands in the doorway. He obviously enjoys story-telling and was an entertaining guide. 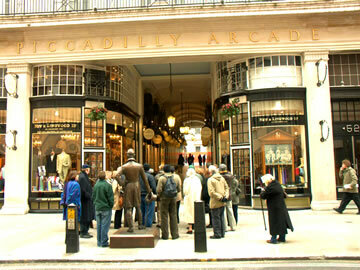 Piccadilly is named after picadils, stiff collars with a decorated border popular in the early 17th century. 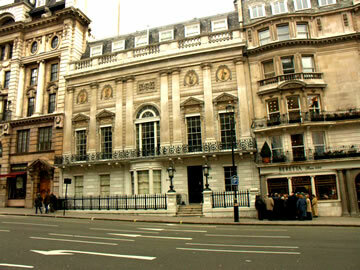 Seller Robert Baker amassed a fortune and built Piccadilly Hall which, unlike the street, no longer exists. 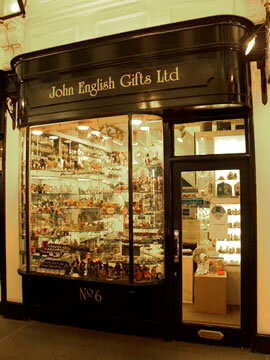 For those who have never been to John English Gifts, this is the tiny store at 6 Princes Arcade in Piccadilly. Brian has been selling Hazle Ceramics here since 1994, after coming out of retirement as a jewellery retailer. The shop is fully stocked with giftware and collectables. Most Hazle flatbacks are behind the door. A couple of years back it featured in a Dutch newspaper as one of the ten best things in London! As the shop is so small, Brian keeps spare stock in the offsite storage unit that he visits most days. Out of Princes Arcade and into Piccadilly we pass Hatchards bookstore, founded in 1797 and currently having three royal warrants. The late Queen Mother withdrew hers when it began selling books on modern royal scandals! Above, Burlington Arcade is full of luxury shops and still patrolled by liveried beadles. Next door Burlington House has the Royal Academy, a Society for celebrated UK artists plus the RA School for postgraduate studies. The building is home to five other "Learned Societies". 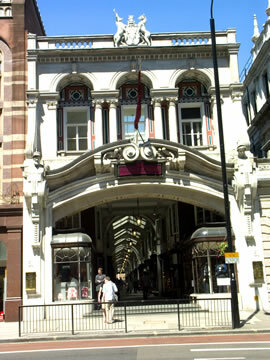 The Jermyn Street entrance to Piccadilly Arcade, one of three along Piccadilly from the 1700s, when it became fashionable for the upper classes to shop for luxuries themselves rather than send servants. Collectors view the statue of Beau Brummell (1778-1840). This was erected in 2002 for his contribution to mens fashion. Brummell quarrelled with the Prince who then snubbed him. Beau responded by asking his companion, "Alvanley, who's your fat friend?" and fell spectacularly from grace. To escape from vast debts, he fled to France in 1816. Lord Alvanley continued to support him but Beau died penniless and insane from syphillis and strokes. 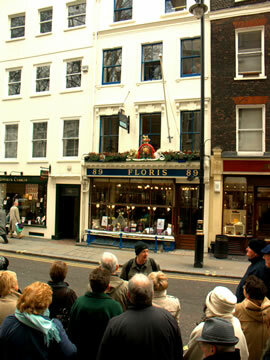 Peter and the group opposite Floris at 89 Jermyn Street. Proprietors of other famous stores in the area that Hazle may wish to model have asked to see how Floris turns out first! Founder Juan Famenius Floris set up as a barber and comb-maker, but missed the aromas of his native Menorca and began blending oils and essences from Europe in the basement from 1730. 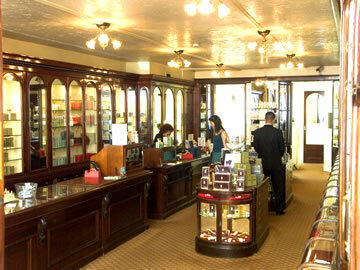 The shop has been on Jermyn Street ever since but scents are made in Devon now. 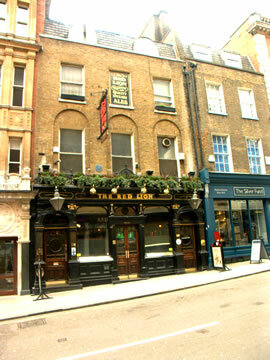 This is The Red Lion in Duke of York Street just off Jermyn Street, on which Hazle's retired Victorian Pub is based. The black front was brown when she photographed it in the early 1990's. The brick wall is smooth stucco on the ceramic. Original 160 year-old carved mahogany and cut-glass mirrors are inside the Grade II listed building. It was voted "Most Authentic Pub 1999" by CAMRA (Campaign for Real Ale) and is popular for its pub food too. Above, Floris has Spanish mahogany showcases from Prince Albert's Great Exhibition in 1851. Ledgers show an amazing array of clients, including 17 British Royal Warrants. Beau Brummel discussed his personal fragrances with Mr Floris for hours! The cleaning of coins and ironing of bank notes is no longer done but change is still given on a velvet pad! 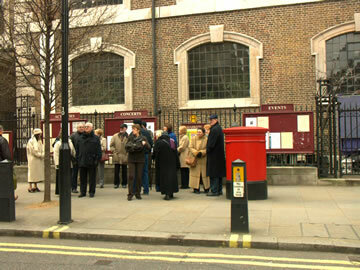 Walkers outside St James Church in Jermyn Street. Sir Christopher Wren's only town church in the West End was built in 1684. With a vaulted ceiling, the main chamber is far grander than the exterior. It is currently a vibrant church of international renown. 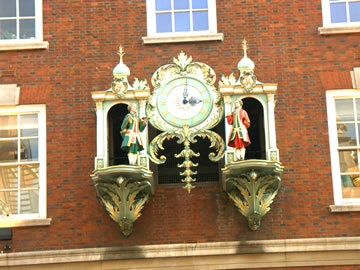 On the Piccadilly side, the small St James' Market has traded in the grounds for centuries. 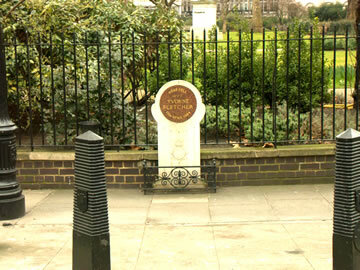 This is the monument in St James' Square to WPC Yvonne Fletcher who was shot by someone from the Libyan People's Bureau during an Embassy Siege in 1984, aged 25. She was the first and until recently the only woman police officer in the UK to be killed on duty. Yvonne was a contemporary of some of my cousins who lived in the same town of Gillingham in Dorset and went to school with her. 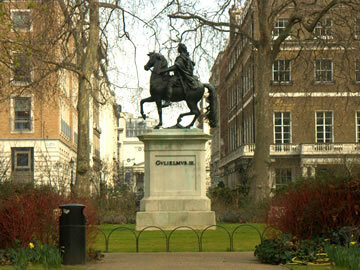 This statue of William III (of England) in St James' Square shows his horse tripping over a mole hill. He died of pneumonia in 1702 after breaking his collar bone then. As King William of Orange, English Protestants persuaded him to depose the unpopular Catholic King James II in 1688. His wife, James' daughter Mary, was heir to the throne. With William already a monarch, they ruled as William and Mary. 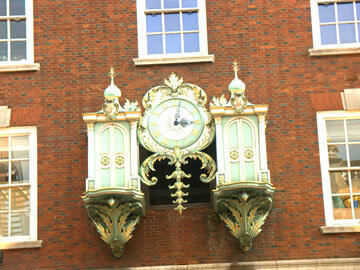 On Piccadilly Peter had spoken briefly about Fortnum & Mason. Their history is covered in the previous John English Signing in 2003 when we were treated to elevenses there, followed by a tour of the store. As a few of us walked back along Piccadilly after lunch (with the Peace March on the opposite side) I realised it was nearly 3pm and that Fortnum's clock would open on the hour with William Fortnum left and Hugh Mason emerging to bow.